Like everyone else out there, we got an Instant Pot on black Friday from Amazon. I have been hearing great things about this little gadget and I could resist no longer. I will say it took me a little while to open it. With the holidays our chocolate shop was swamped and we just had no time. And I’ll also say, it was a wee bit intimidating. There is something scary about a pot that can blow up at any moment! I know I’m not alone in that thought, right?!? The day finally came after Christmas I decided to give it a go. I read the instruction manual, about 100 times. I can probably still recite it. (It’s not that much info) I then went for the water test to make sure it heated up properly and there were no issues. All was good so far. Now what to cook? Everyone said how easy cheesecake was, so I figured why not. The first cheesecake I made was a New York style topped with caramel and pecan brittle bark. I was amazed at how easy it was and how perfectly cooked it was. Hmmm, I thought. What else could I try? Of course chocolate things are always the goal for me, so I figured why not try a chocolate cheesecake. I did some research and saw a recipe in The Great Big Pressure Cooker Book for chocolate cheesecake. I gave it a go. It was good, but needed a few modifications, like more chocolate. After some testing we came up with the triple chocolate cheesecake. This is over the top decadent. Super rich and a little goes a long way. But soooooo good! We have now made four chocolate cheesecakes and everyone I know has broken all New Year resolutions for weight loss. Obviously this recipe requires an Instant Pot We also used a 7-Inch Round Springform Pan . These are the only special requirements for this recipe. I hope you enjoy it as much as we did. Happy New Year! If you would like something other than ganache on top we made a Raspberry Mousse Chocolate cheesecake, and if chocolate isn’t your thing at all, we also have a pumpkin cheesecake in the Instant Pot. What kind of chocolate do you use for the ganache – the 3/4 cup? We used 53 – 60% chocolate. Whatever is your favorite brand should work. Most of our products use Valrhona. For the ganache we used a callebaut 53%, but again go with your favorite. Was just reading for answer to the type of chocolate in this cheesecake. I’ve never heard of the brand you use. So what I need to know is it bittersweet, semisweet ? This is about a 65% chocolate. Go with what you love to eat. What is the rest of the % made out of? We do not understand what you are saying and that’s why many people have asked the same question. What does that percentage mean? I do not understand that in any way shape or form. Looks amazing! Did you line your springform pan first? Did you open it only after you did che chocolate topping or before? Any idea how I’d adjust the recipe for a 6″ cake pan? Thanks!! One recipe I used said add 5 minutes for a 6″ pan. Did you use foil to cover the cheesecake while cooking to keep moisture off the top? Nope. We just used a paper towel to dab the moisture off once done. You could use foil if you like. Wow. This recipe was not at all difficult and it turned out perfectly. Really, really delicious! I’d had mixed success with cheesecakes in the oven before. This was too easy. I should add that the quality of ingredients makes a difference. I used 63% Scharffen Berger chocolate. Do use a quality chocolate as the chocolate flavor really is front and center in the final product. I followed the recipe exactly as written (used Fat Daddio’s7-inch removable bottom pan) and it was flawless. Keeper for sure. Please tell me what kind of chocolate. Do u mean like candy coating or chocolate Barkley choco chips. I made two cheesecakes in my Instant Pot last week, this being one of them. Both had the same amount of cream cheese and were prepared in an 8″ pan. The lemon cheesecake was perfect in 15 minutes. This one had to go back in twice because it wasn’t setting and ended up closer to 35 minutes. It still turned out great though. The other recipe recommended incorporating the eggs by hand. I think this tip could improve your recipe because the batter on the chocolate cheesecake was much “drier” than the lemon cheesecake. It’s likely hat I over mixed it, and folding it by hand would avoid this problem. Also, I used chocolate 70% chocolate to cut down a bit on the sugar and it still tasted great! Glad to see that it still tasted great Wendi. I like using the dark chocolate also to cut down on some of the sugar. Wow, expecting our Instant Pot Monday, my wife had reservations about biying this, but she is a veritable chic-agility, I believe this will win her over! Do you think I can make this in my 6 inch daddio push pan? Time/cook difference? I only have the 6″ pan, do you think I need to add more time to the cook? Oh my gosh! I made exactly to recipe and it was perfect. I used Lindt milk chocolate for the cheesecake and used a combination of milk and dark chocolate for the ganache. Absolutely perfect! You mention the “whole” Oreo cookie so you do not scrape the filling off, correct? Paul, I used the whole cookies… the white insides too …. and my crust turned out great. I made this using a 6 in pan. My only suggestion to change the crust. It’s a bit too thick for the smaller pan. It was still fantastic. You could always use some of the crumb mixture for the top of the cake. Serena, just got through putting the cheesecake in the IP so I haven’t tasted it…..BUT! if it tastes even 1/2 as good as the sppon of batter I just licked clean, then we are in for a real treat!!! This was SO good!! Thanks for posting the recipe. I used Lindt milk chocolate bars for the chocolate in the cheesecake. And for the ganache I used milk chocolate chips. After that cooled and set, I melted some white chocolate chips and drizzled that on top for a little decoration. We all loved it. 3/4 cup of chocolate, whatever is your favorite brand. We used Callebaut, which comes in blocks or callets. The hot cream will melt it once you pour it over the chocolate in step 17. You use 3/4 cup of melted chocolate for the ganache. Can you please tell me how many ounces or grams that is? Thanks. Just took the cheesecake out of the pressure cooker at your stated time and it is perfect. Can’t wait to taste it tomorrow. OMG! I have never made a cheesecake before. Didn’t even know what a Springform pan was. I got a Daddio 7″ pan for the IP and decided to give this recipe a try for my husbands birthday. He was in heaven! I can’t believe I made a cheesecake and it actually turned out! Thank you for the recipe! I have two observations to make about the recipe. 1.) The ingredients call for 1 Tbsp of Cocoa powder, but the actual instructions do not have this ingredient in it. I assumed that you just added it in with the flour. fingers crossed this is correct. 2.) For those of us who have never used a instant pot before, you might want to mention if the pot should be set to venting or sealing. I have only made a few things with my pot, so am still learning all of this. As I type this, my first triple chocolate cheesecake is cooking. If it tastes even half as good as the batter, I am doooomed! I’m sorry you missed the cocoa powder. It’s listed on step 6. I’m guessing it turned out fine with the flour. Great idea about adding instant pot tips to the recipe. This was our first time using it and over the months I have become more comfortable with it, as will you, as you continue to use it. I hope it was delicious! This didn’t work for me. It rose past the top of the 7inch springform pan and the top was not set at 28 minutes. Having to wait for pressure release, then wait for it to come back up to pressure, etc. is nowhere as easy as opening an oven door to check to see if it’s done. I love the instant pot but I won’t make this again. Rechecked all ingredients, measures, and methods and can see that I followed instructions to a T.
That’s such a bummer Eileen. So sorry it didn’t work for you. If you have rechecked ingredients and measurements, I’m wondering if you and I have a different model of instant pot. We have made this numerous times and it always works out. Maybe yours is newer than mine, or vice versa and cooking times and temps change a wee bit based on manufacturer changes. Difference in sea level can also make a difference – it sometimes takes longer in the IP in say – Denver, than lower sea level cities. I had the same problematic results as Eileen! I live in Florida, so wondering about the sea level comment. Serena – are you in a higher altitude? I’ve also heard this can affect things, so perhaps I need to adjust for this? Hi Kim. I’m in Austin so definitely nothing like Denver altitude. A bit higher than Florida, but nothing horrible. You are shooting for an internal temp of 150F. When we tested the recipe we did a manual pressure release right away and took the temp. If it wasn’t to the 150F, then we turned back on for a few more minutes. It might be worth trying that instead of waiting for the system to release the pressure over the 10 minutes or so. I’m also wondering about the humidity. We tested in winter with very minimal humidity and your region of the US is quite humid this time of year. Usually high humidity can increase cake volume and moisture content. I wonder if that is happening with the instant pot. It’s definitely a stretch, but maybe… And last but not least, (this is making me very curious so trying to research all options, sorry for the length in this response) are you using the exact same springform pan as I was? From what I see after just searching Amazon, it appears each brand has a different height. What you want is to fill the pan right around 3/4 full or just a tiny bit more. But don’t fill any higher than that. I hope you give this another try, I’d be really curious to know if any changes. You may a great point about humidity (it’s super high here! ), but not sure if/how that would affect it. I am using a Nordicware 7″ that I just got from Amazon. I had tons of batter and it filled the pan all the way to the top (which explains the overflow!). I probably should not have used all of the batter so good to know about the 3/4 full. I will give it another whirl at some point and post if I learn anything. Thanks for your suggestions! What type of cocoa powder did you use? Was it Dutch process or the regular kind? Love this recipe! I’ve now made this many times and everyone raves over it! I do usually need to add three minutes to the cook time using a 7″ springform. Tonight I’m trying to make these into mini cheesecakes….using silicone for the first time. Wish me luck! So glad you love this! How did the mini ones turn out? what would the cooking adjustments be for an 8″ pan in an 8qt IP? I haven’t tried it with an 8″ pan. But I would reduce by just a few minutes and then do a manual release of the pressure as soon as it is done and take the temperature of the cheesecake. You are looking for an internal temperature of 150F. If not up to temperature, turn it back on for a few more minutes. How would you adjust the time for an 8 inch pan? I have a Vitamix blender, but I don’t have a food processor. Can I use an electric hand mixer? Yes, it will just be a wee bit fluffier due to air being mixed into the batter. Be careful not to overmix and you should be fine. I made this and it turned out really amazing. I used 60% dark in the batter and a hazelnut milk chocolate for the genache. The taste was divine. One question: i followed he recipe to a T and used very high quality chocolate, but it turned out VERY dense – almost like fudge. Any suggestions? Also, why do you use the food processor for the batter instead of a mixer? So glad you liked this Marcia. We use the food processor to get a dense cake, like a NY style. We found using the mixer gave it a fluffier texture. It just folded in a bit more air than I wanted. I would guess that you may have overmixed a bit if it was like fudge. This cake was delicious. My only problem was the ganache put it over the top as far as sweetness (that’s just my personal taste others may find it just fine). 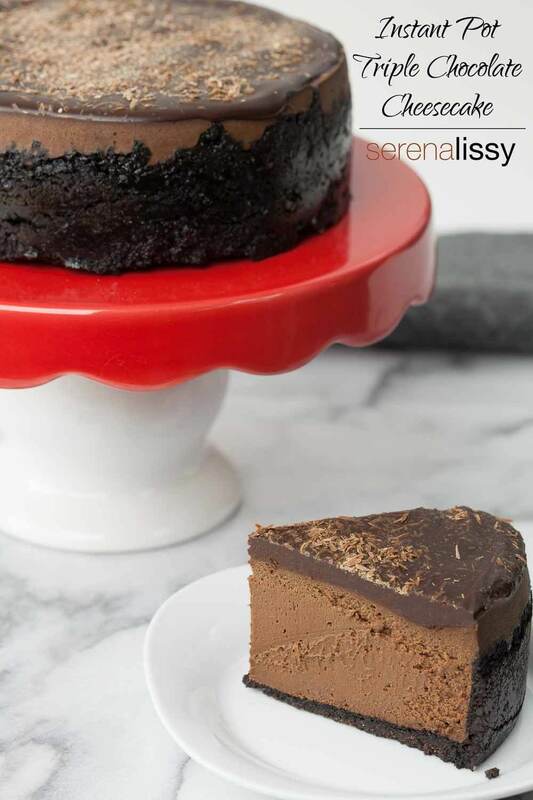 I do love the idea of a ganache on top, but wondered if you have any suggestions for cutting the sweetness of the ganache or perhaps another type of topping instead? You could try a much darker chocolate in the ganache. Would definitely reduce the sweetness. Or even just no ganache at all? This is absolutely the best chocolate cheesecake ever. I want to make some in 4.25 inch pans as Christmas gifts. Do you think I could bake two at once using a rack? And wouldn’t the cooking time be altered, too? I am thinking I could get two cheesecakes out of a single batch. I am making 8 cheesecakes. I would love your input on this! Thank for this amazing recipe! I don’t have a food processor 🙁 I have a Blendtech (like a vitamin) and hand mixers. Would either of these work? Yes you could use these. Just be careful not to overmix the eggs. Your cake won’t rise as much if that happens. My husband is Celiac so what can I use instead of the 1 Tbsp of flour? I just got my IP and never made cheesecake before! Would love to try this! Try Xantham gum!!! I’m not 100% sure on the ratio, but it’s a fantastic thickener for baking that is gluten free and nut free!! Interested in trying this for a Christmas party. I’ve only made two other dishes in the instant pot so far. Have a 6 qt duo plus. Any other tips to make sure it somes out well? Follow the instructions and you should be fine. It’s pretty simple. Don’t overfill the springform pan. After some comments I learned that not all pans are the same height. I was wondering – I make my own greek yogurt in my IP, and I use it plain on baked potatoes instead of sour cream. Do you think I could substitute plain greek yogurt for the sour cream in this recipe? I’m trying Greek yogurt in my IP today! I’m excited. I’m going to say yes I believe you can substitute, but I have not tried it before. Now I’m curious. If you end up making it please share how it turns out. This is one of the best baking recipes I’ve ever used, and I used to bake for a living. I made it for Thanksgiving, then for my husband’s birthday, and going to make it again for Christmas Eve. Highly recommended! I’ve seen a few questions and answers about the chocolate, but I’m still a little confused…What form of chocolate do you use for the 3/4 cup chocolate in the ganache—bars? Chips? Should it be 3/4 cup before or after melting…and if you’re using a chocolate bar, how do you measure 3/4 cup? I used a high quality chocolate chip. You could use bars also, either works. 3/4 cup before melting. Cut the bar into small pieces and put it into a measuring cup. Hope that helps. Ha! I think I should have a blast chiller also, but I’m right with you, none for me either 🙂 Shoot for as long as you can with this. Try for 8 hours. Worse case, it is going to be a bit soft, but should be fine. Happy New Year! Is there any reason why the IP should take 20+ minutes to come to pressure for this recipe? Or is something wrong with my IP? Thanks. My IP never did seal but, despite that, I could tell that the cheesecake was cooking. After a looong time, and several cups of water later (to fill the IP), the cheesecake measured the right temperature and it came out perfect (in a 6″ pan)! I’ve ordered a new sealing ring – hopefully that will do the trick (my IP is only 8 months old!) and then I can try the cake again according to the recipe instructions. I might omit the sugar or use a much darker chocolate next time, as it came out quite sweet. Anyway, thx for a great recipe! I made this today using 6” corningware bowl, lined with parchment paper and oiled. Didn’t change anything else. Once cooled I put a plate over it and flipped, tap tap tap till it popped out, peeled the paper then put a platter I wanted to serve it in over the cake and flipped again. Lastly drizzled the ganache all over the top and popped into the fridge. It’s rich and so delicious!! Thank you so much for the recipe! Thank you for sharing your wonderful recipe. I have made it several times and it never fails. I get lots of compliments on it too. How can I tell if my springform pan will work? I have a Duo 6, 9 in 1. I have an 8 inch springform pan that fits into the instapot pan but with very minimal extra space. How do I know if this is an adequate fit? Only one way to really know. Give it a try. I don’t have an 8″ to experiment with, so without seeing I can’t say for sure if it will work or not. This is a fantastic recipe. Definitely don’t do it in a 6″ pan. Ha! It will overflow. Not a lot and it is a lot easier to clean up then the bottom of the oven. It did take an extra 5 minutes on high pressure. I could have done it in my 8″ pan but I wanted a tall cheesecake. With the ganache you can’t see the top anyway. 🙂 I will invest in a 7″ pan now. Can you make the cheesecake w/o an instant pot? Don’t haven & am not going buy one. Yes, you could bake it. Since I haven’t tried this recipe in the oven I’m not sure a total cook time for it. But I’d put a pan of water into the oven to create the moisture and cook it until done. Possibly 45 min to an hour. Test for doneness as you bake. So you didn’t cover the cheesecake before putting it into the IP? I just made my first one 2 days ago and I am going to do yours next but all of my research recipes had various different tricks to keep the water off of it. (mine said to put a paper towel over it and then cover loosely w/foil). And I have the pushpin (Fat Daddio’s so I can’t loosen the ring. Should I pour the chocolate topping over the cake while it is still in the pan or take it out first. I can even put some parchment around it after it cools for a border if you don’t think I should do it in the pan. Did you just put the cheesecake IN the water or use a trivet? Yes you can cover the cheesecake loosely with foil before putting in the IP to keep some of the water off. Then when done cooking, if any water use a paper towel to dab any moisture off. I’m not familiar with the pushpin pan but I would take it out of the pan once cooled then put the topping on. Did you use the Manual setting? Hi there. 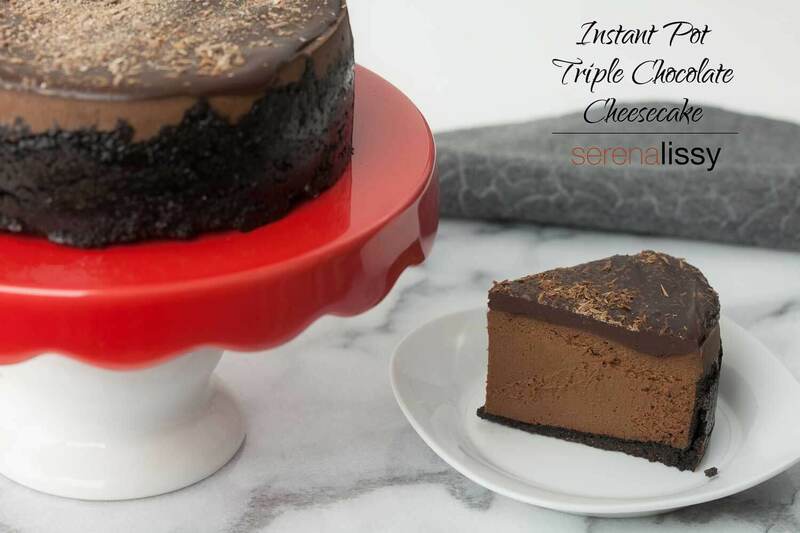 I just made this triple chocolate cheesecake and it’s in the instant pot as I type…. my question is “maximum pressure” does that mean high pressure then select ” more “? If so this may be the issue people are having with it not being cooked after the 28 mins.?? Yes high pressure. Possibly, but I can’t be certain without seeing what someone is doing wrong to begin with. If I were to guess (just a guess) I’d say they are wrapping the foil too tight on the top of the cheesecake to prevent water. If wrapped tight like a lid, it will require longer cooking time. I had planned to make this cheesecake in my little Mini Instant Pot (3 qt) and take it to our Super Bowl party. But it snowed and the party was cancelled, so I didn’t go to the store to get the rest of the ingredients. Then I couldn’t get the darn thing out of my head, so I made it and improvised. I only had one package of cream cheese, so I halved the recipe. It was the perfect size for my 6″ pan. I did not have any sour cream or whipping cream, but I did have some fat free half and half, so I used that to substitute for both. I didn’t have chocolate cookies, but I did have some left over vanilla wafers. I used them and added a handful of slivered almonds as I crushed them in the food processor. I just ate a piece and it is MARVELOUS. I hadn’t read carefully enough so when I opened it and there was some water on top, I didn’t know what to do and just left it. It went away and nothing was soggy. I’m guessing it was absorbed? I may have also used Splenda blend brown sugar, but since I was very unorganized and have both the regular and the blend in my cupboard in plain plastic bags, I don’t know for sure. LOL! Oh, and I didn’t try to do a half egg. I just used one egg and one egg yolk. I have pictures, but I don’t see that I can attach a picture. Oh my gosh! Thanks so much for my smile today 🙂 This is what cooking is all about, trial and error and experimenting! Love it! So excited to make this for my family for Valentine’s Day. What garnish did you add on top of the ganache for the photo? That just tops it off and adds another level to it! Just some shaved chocolate. Enjoy! This was the first cheesecake I’ve ever made and the first time I’ve used my IP. I’ve been told it came out dry for me. Any ideas on what I could have done wrong? Gosh, hard to say. Could be many things. I’d give it another try. Make sure not to overmix the ingredients. Are you using the same size pans and the same instant pot model? This recipe looks amazing and it is cooking in my IP right now. Only question I have that I did not find in previous comments or questions is do you use NPR after the 15 minutes on normal or quick release? NPR is good for the release. Just made this today! It’s cooling in the pan on a rack and looks great. Question: do I take it out of the pan before putting it into the refrigerator or is that the last step before the ganache? Thanks! Can’t wait to try it tomorrow. Thanks! That’s what I figured but I know very little about cheesecake or springform pans ha. It came out amazing! My mom said it was the best cheesecake she’s ever had! Thanks so much for the awesome recipe. How would you adapt the pressuring time this to making in ½ pint jars? I made this in 8 half-pint jars today. I pressure them on high for 6 minutes and a NPR for 10 minutes. Delicious! Please tell me what I’m doing wrong! I followed directions exactly and ended up cooking it three times for a total of 80 minutes! Not really certain what is going wrong. Sounds like an IP problem. I’d double check you have the valve on sealing and not venting when cooking. I’m planning to make this tomorrow. There’s only 2 of us, and my husband isn’t as fond of chocolate as I am. Can this be frozen? Sure you can freeze this. I froze this just so I wouldn’t eat it too quickly! Only problem is, it tastes great frozen too. LOL! But we were able to make it last a week, and I only did a half recipe in a 6″ pan. This is wonderful. I’ve made it twice and loved both of them. 1 1/2 times the recipe to make a good sized cake for a family function. Can you possibly give me an estimate for cooking time with bigger recipe and pan?? Thanks! For the cheesecake batter instructions it says to use a food processor to mix. What setting on the food processor and for how long? And chocolate garnish did you use for the finished product? Just pulse the batter until combined. Don’t overmix, it will change the texture a bit. The chocolate garnish is just chopped chocolate. Use whatever is your favorite. Thank you. This turned out fantastic! I am a long time baker. I have made many cheesecakes that took 2 or 3 hours, sitting in closed oven after an hour of baking, then cooling an hour. This was up there with one of the best! I could not beleive how fast and easy… and really we don’t need a 10″ cheesecake talking to us for two weeks! I made this on Thursday, following the recipe exactly, and it was divine! Tonight I made it in individual little mason jars. I haven’t tried one yet but I’m sure they will be great! This was very expensive to make, and WORTH EVERY DOLLAR!! Thank you for the recipe. I’ve had my Instant Pot only for a month (Amazon Prime Day 6 qt Duo for $58!!). I made a different cheesecake shortly after I got it. Then saw this recipe and thought it looked worth a try. This is the first time in a LONG time that a recipe has been SO good I’ve wanted to post a review. How perfectly, decadently chocolaty without being too sweet or too bitter. So rich and creamy but not gooey or cloying. If I only ever made this cheesecake in my Instant Pot, it would still be 100% worth the price! Thank you for posting this…and thank you for the future extra pounds I can feel coming my way. Delicious. Amazing. Yum. That is so wonderful to hear! I’m really glad you enjoyed this 🙂 And thank you for sharing! In step 13, do you mean do a NPR for 15 minutes? Or do you hit “off” then “pressure” to move to low pressure (without opening lid) and then adjust time down to 15, and then do a NPR after that? I’m making it right now and couldn’t figure this step out even after reading all of the comments. I’m doing the second option and hoping for the best. Thanks! NPR for 15 minutes. How did it turn out? It was delicious! We put strawberries cut into the shape of hearts on top. Wish I could post a photo of it here. Thanks for the clarification! Omg. So good. Didnt have 7 ” spring form so used parchment paper and oil in 7 inch Corning wear casserole dish. Then dumped water into my insta pot without insert so drying that out for 3 or more days b4 I try use it again. So instead baked crust for 8 minutes at 350 then added filling and turned oven down to 300. Put dish in a water bath and baked for 1 hr. Turned off oven and let sit in there for 1 hr. Then cooled on rack for 1 hr b4 refrigerated. Turned out amazing. So glad that worked out! For the cheesecake I replaced half of the cocoa with ground up espresso coffee beans in a vanilla Carmel liquor flavour. It was amazing. I’m trying this today- second cheesecake I’ve made in the instant pot. I expect this will be a new favorite! I’m going to add some grand marnier with the vanilla, about a Tbls. Hope I don’t make it too wet. It wasn’t too wet. The liquor added some depth of flavor. Also added a small amount of espresso powder to the ganache to punch up the choc. Turned out lovely, an irresistible dessert! what is your take on adding some instant coffee/espresso to the chocolate? Oh no. I missed the cocoa powder!! But the cake looks great. Will this effect the taste? I’m so sorry just seeing this. How did it turn out? OMG! This was the best. My sister made this and it turned out absolutely divine! The next few days after our original celebration, I kept asking if I could come over and have another piece. So good. I have never had better! Thanks for sharing. I can’t wait for my birthday now as THIS IS MY NEW FAVORITE. Would I be able to make this without a food processor? I have a blender and hand mixer? Yes, a blender will work. Just don’t overmix and it will be fine. I didn’t read all the comments but I’m wondering the same thing. You can buy bittersweet chocolate at the percent you are saying but you can also buy unsweeted at that same percent. The question remains is it bittersweet chocolate or unsweetened chocolate at that percentage.